Meanwhile unfortunately disproportionately expensive but still very delicious. The fragrance is after a short time absolutely overwhelming. From minute to minute, the fruity-full flavors spread more. Equally entitled 'Papaya + Mango + Pineapple + Pear'. In the background, a sweet vanilla mascarpone cream complements the ripe fruit perfectly. Much better for my modest taste barely - at least as far as the fragrance is concerned. I use a small lid to Glencairn to repeat the experience over and over again. Every now and then he likes me a little bit better. Gentle start but not watered down. Many older malts give a very similar impression. Great, velvety-oily mouthfeel. You can clearly see the cleanly incorporated alcohol, which calms me down, as I had feared that Malt could have lost over the decades maybe a little too much in power. But he does not. The fruity enjoyable experience from the nose continues in the mouth. If not with the same overwhelming presence as before. It would have been too nice. But no dram. A great, creamy pear note remains, as does the mango. In addition, a slight oak spiciness, which was naturally unnoticed in the nose, but now reminds of the ripe age of the malts. For a non-smoker, an exceptionally long finish, in which the fruit, after a short break, turns into grassy impressions and woody notes. Interesting change. No excessive bitterness, no other junk notes. Nice round. Another brief consideration of the alcohol strength. The natural way, so without further addition of water, in the course of decades in alcohol to just above the minimum strength "reduced" Legacy V is a prime example that great Geschack long ago not only in combination with excessive alcohol content to please. Cask strength, which develops very slowly to the drinking strength in the way of the maturity, promises mostly great pleasure. So here too. I feel the 40.9% ABV as sufficient, on the palate even more on a little more typed. 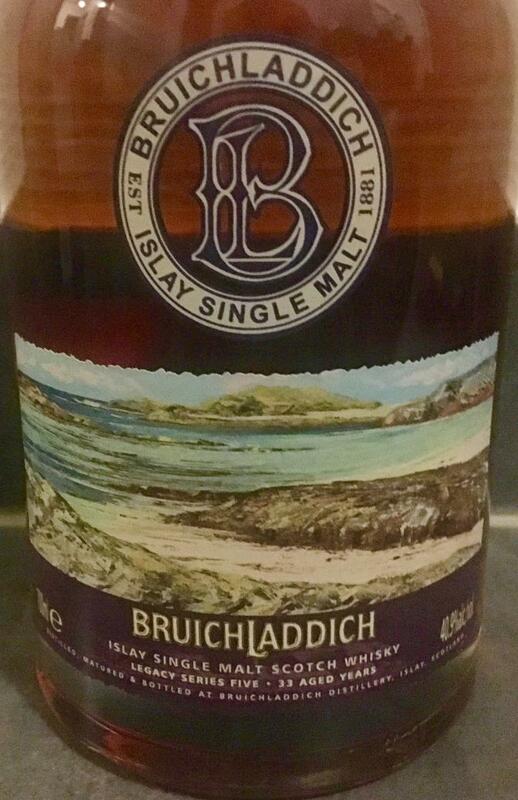 I have samples available of this whisky, please contact me for details. Balanced fruity, not sweet, with maritime hints. Slightly more vol% ... that would be fine. The first aromas that rise to the nose are surprisingly fresh, some grapes. Then quickly these are replaced by something darker fruits. No alcoholic biting or burning. With hand warmth the nose gets a slightly drier character. Still fruity and sweet. Here the balance of this malth becomes clear. The still fruity tones, which do not really look sweet, are complemented by very little maritime salt and some spice of the oak. Here, too, nothing beats or bites, but it is not really a force. The maritime tones linger a bit next to green, fresh oak, cocoa and leather, which displace the sea air more and more. If this was at 48% it would be an absolute belter but it just lacks a bit of power for me. Delicate on first nosing and not particularly expressive but keep at it. Giving it 5 minute's in the glass and letting it breath opens it up nicely. There is some mango and cherry in the mix with caramel short bread and juicy dark raisins. Orange liqueur, a little dark honey, milk chocolate and a slight cornflake taste. Finally there is a some caramel. 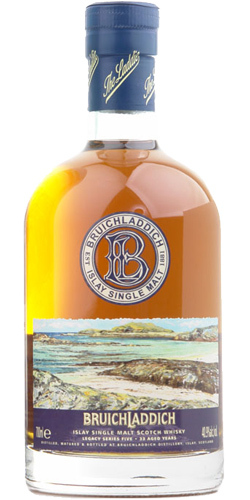 The fifth release in Bruichladdich`s Legacy series, this is a mix of sherry and bourbon cask whisky, including some from as far back as 1968. Very long on a slight bitterness.